© Tao Think - bone structure of Daodejing #36 (English commas added). Perhaps the most desired, as well as simultaneously being the most disdained word in the English vocabulary, is, 'think'. Most all people want to be smart, to be able to think better than everyone else on earth, but, 'thinking' requires a lot of effort... sustained effort... 'thinking' is not effortless... it is easier, to lift heavy weights all day every day, than to 'think'... easier, to suffer all hardships, than to 'think'... people often choose death, rather than 'think'... 'thinking' is so highly self-demanding, that most people choose to not think... the people, simply, choose, to avoid 'thinking', while also claiming, and believing, that 'remembering' memorized words is all the 'thinking' that is possible. People highly desire to be 'smart', but the people will not exert an effort to 'think'... the behavior, does indeed, exhibit an inability to think. The concept of 'thinking', is itself so disliked, that modern English does not so much as have words that differentiate the differences between memories, reciting memories, and thinking. People, today, are taught to believe that all acts of the mind are identical, the same, equal, and can only have one name: 'think'. The absence of the English language possessing words that point to different mental functions, does, indeed, prove that the knowledge does not exist within science, nor within philosophy, nor within academia, nor within the individuals who assemble English dictionaries. The English word 'think' has an disproportionately high quantity of English synonyms, almost all of which, either contradict the other, or do not relate to thinking. Dictionary knowledge, of what 'think' means, is vacuous, which again verifies that the English word 'think' has no meaning. Most people today, do believe, that memorizing another person's words, and to then recite the memorized words... is thinking. Nevertheless, the act of believing is an act of believing... not an act of thinking. The traditional Chinese language characters are quite excellent tools for illustrating thinking, as well as illustrating the absence of thinking... also, as well, of illustrating the eternal errors within western philosophy, academia, science, and all other memorized beliefs. The Chinese word 道 (dao or tdao or tao, whichever flavor a person might prefer), is often interpreted, in English, as 'method, path, principle, reason, road, skill, talk, think, truth, way'. The Chinese word 德 (de) is often interpreted, in English, as 'favor, heart, kindness, mind, moral, morality, virtue'. The Chinese word 經 (jing) is often interpreted, in English, as 'classic works, deformation, doctrine, endure, pass through, principle, thread running lengthwise through woven fabric, warp, weave'. Each word, many different meanings... many different ideas... many different 'causes' and 'effects'... and many different origins of source. The English words have no meaning, because, the English words were invented without first knowing what the words point to. The Chinese symbols, however, make use of thinking... of seeing a visual concept, and to then self-think of how the visual concept relates to one's own self-experiences in life. The problem, however, is that no two people have the same experiences, nor have the same feelings, nor have the same thoughts. The inability, for any language, to write a word that has the same meaning to everyone, can be a very useful tool for illustrating each person's own life experiences, as well as each person's own thoughts and heart. Chinese words are often composed of symbolic 'radicals', making use of portions of the combined radicals' pronunciations to enable a written form of a spoken word. The symbols, themselves, are often irrelevant to what the spoken word implies, but, often the symbols do create the word's conceptual meaning. Regardless of whether 道德經 was intended to imply a phonetic word, or literal concepts, still it is very useful to pause and to think of each of the three Chinese words' plausible origins. 德 = (Left symbol, implies 'person taking a small step'), ((right symbol, 'ten' (which could also imply ten as being the perfect number), 'eyes', 'straight (or no concealment, or under surface, or correct ('one'))') with underneath ('xin' implies 'heart')). Concept: 'Ten, eyes, straight-correct, heart, small steps'. Plausible idea: 'Many eyes see, heart straight, small outward movements.' Also plausible: 'Of what is seen, the heart chooses, steps are small, careful.' Also, 'Small, careful steps of what is perfectly seen... heart chooses'. The small, careful, steps, point to the heart being the control-cause, and if the heart is careful, then the heart cares of correctness... inner virtue. 'Perfect, eyes, correct, heart, careful steps'... each requires continuous conscious thinking... each, requires continuous conscious caring... combined, create a communicated concept of what 'virtue' might imply. The idea of 'woven strings', also a common concept amongst Native Americans, is like chidao... is like, harmonious music notes, that create a new song more beautiful than ever before heard... is like, colored waters that blend to create a new color never before seen... when inner 'woven strings' harmonize, it is then that a new creation is created, a creation that before could not be imagined... chidao. 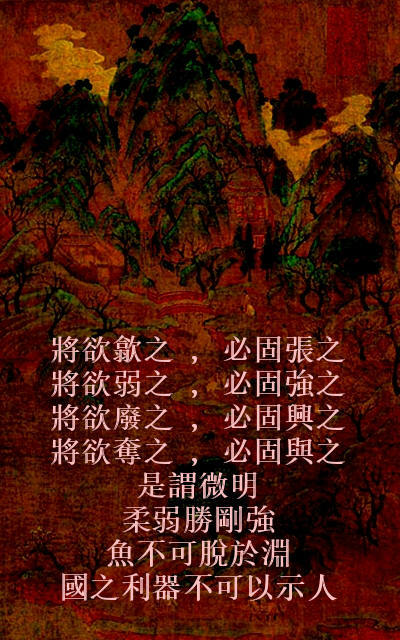 Therefore, within the Chinese symbols, 道德經 might imply:  'Observe, think, analyze, walk analyses...  obviously seen on outside, heart concealed inside, small careful steps...  inner streams, woven as like fabric'. Take away 經 (jing - weave), nothing changes... same woven analyses create same virtue... do not need 'jing' word in the three-word sentence, because, accurate thinking and accurate analyses are only possible by weaving strings of thoughts. To not observe, think, and analyze correct choices relative to what is real in Nature, then, the result can only be of imaginations... fantasies... twisting one's inside mind to fit one's outside desires... useless, self-destructive things... no longer a human with intelligence, but, rather, a common animal unconsciously driven by selfish desires... bad. Ren, 仁 (ren), implies 'benevolence'... the Chinese character is said to be composed of the word 'two' (二 er) added to the word 'people' (人 - a differently pronounced ren)... therefore, the combination of symbols implying something close to 'feelings between two people'. However, the symbols by themselves do not hint of what kind of 'feeling' exists between the two people. If the feelings between two people are selfish, angry, hurtful, then each person's thinking is not correct... the thinking is negative, selfish, destructive... and, so, then, the behavior is not kind, not gentle, not caring for the other person... not benevolent. One word, same symbols, can mean many different things to different people. By what synonyms are chosen as a translation, so will the synonyms describe the translator's own life, own life experiences, own mind, and own heart. Not easy to explain, because, today, almost all people become angry... the people believing that all 'thinking' can only be possible within an act of memorizing words, magically, within little brain cells. The belief, is formed upon many ingredients, some, being an inability to self-observe one's self... an inability to feel one's own body... an inability to observe one's own thoughts... an inability to think... and a memorized belief that one thing, all by itself... a binary thing... is able to do all things... a belief, that a single tone, can know a symphony song. A mind, not in harmony with the heart, is a callous mind... selfish... ignorant... not thinking. Nothing else in all of Creation exists without harmony, but, most people believe that their 'thinking' needs no harmony. If the ancient Chinese believed that all 'thinking' is within the brain, then why combine 'head' with 'heart' within the word? Phonetic? Maybe, but leans more, on, maybe not. Ancient Chinese, maybe know something, more than modern man? Yes. If the title 道德經 Daodejing means what is says, and is a fitting title, then Daodejing is a book about thinking... about, correctness relative to what is real and creative within Nature... not magical, not mystical, except, to modern people who believe that 'thinking' is only possible, by being handed magical, mystical, supernatural powers from the sky.